Ken Ward Jr. in his office at the Charleston Gazette-Mail newsroom on Sept. 21, 2018. 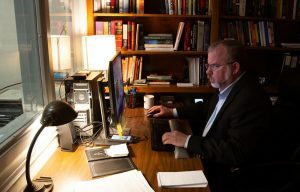 CHARLESTON, W.Va. — Ken Ward Jr., an award-winning reporter at the Charleston Gazette-Mail and the Charleston Gazette for more than a quarter-century, was today awarded a MacArthur Fellowship – commonly known as a “genius grant” – from the John D. and Catherine T. MacArthur Foundation. Ward was chosen because he excels at “revealing the human and environmental toll of natural resource extraction in West Virginia and spurring greater accountability among public and private stakeholders,” according to a citation from the MacArthur Foundation announced today. Ward, 50, is the only journalist in the group of 25 fellows announced today, a group that includes scientists, artists, authors, scholars and advocates. He sees the fellowship as an “incredible honor,” but also an indication that the reporting done here is valuable.